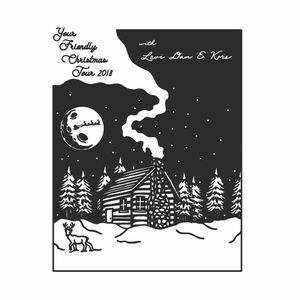 Welcome to the Fifth Annual "Your Friendly Christmas Tour" brought to you by Dan, Kris, and Levi! We’re really excited to create a unique experience for people to make a special Christmas-time memory this year. We want to invite you to be a part of an event that we hope you'll remember for years and years to come! You can buy your ticket to the show right here, and right now. Presales are available until 2 hours before the show starts. If it doesn't completely sell out, then you can always pick one up at the door, but after five years of doing this, and a lot of sold-out shows, we'd recommend securing your spot right now! Below, you'll find three different ticket-price options. They all get you the exact same thing: entry to the show. But if you're feeling more like an elf than a reindeer, or you're in a particularly generous mood and feel like being Santa Claus for the day, you can choose to leave us a tip (and buy us a Taco Bell burrito!) with one of the higher-priced options. Otherwise, just snag the base-cost entry and trot on into the show! We'll be serving pour-over coffee from our friends at Messenger Coffee in Kansas City, and look forward to spending the night with you this December!